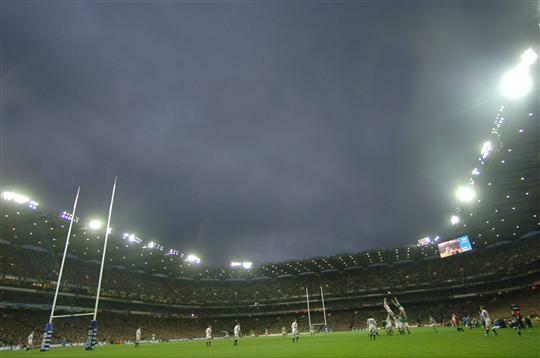 It's hard to recall now but that was Croke Park's new nickname for the two weeks following Ireland's gutting loss to France in the first ever rugby match played at Croke Park. However, the France game was curiously forgotten in the build-up to the next match. It's significance was obliterated in the public mind by all the historical baggage that accompanied the England game. There was simply no more room left in the public memory to think about the France game. The days before the England game were dominated by discussions about Irish history, fraught debates about whether the lyrics of God Save The Queen constituted an 'insult' to the men who after whom the stands in Croke Park were named. Kerry man JJ Barrett went on the news to say he was withdrawing his father's All-Ireland medals from the Croke Park museum in protest. On the day itself, Republican Sinn Féin (Ruairi O'Bradaigh's party) activists gathered on the Clonliffe Road. 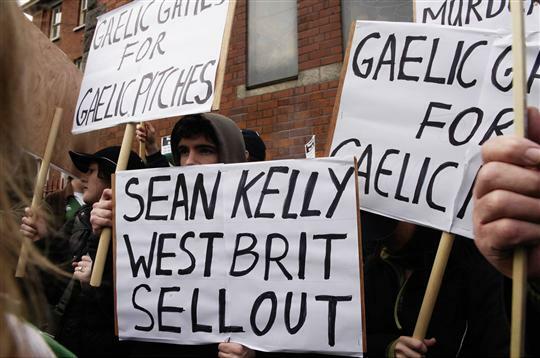 Their placards bore the message 'Ireland 32 England 0' and suggested that Sean Kelly was a 'West Brit Sell Out'. All it took was one of their number to wear a Celtic jersey. They should really have insisted on a dress code. The Irish crowd had set a formidable challenge for themselves. Listen to the band strike up 'God Save The Queen' without jeering. It was a challenge that proved beyond the Irish crowd in Lansdowne Road in 1995 and indeed beyond most home crowds in every corner of the world. Once God Save The Queen started ringing around the place, it became apparent that it was unmolested by any whistling. There was considerable relief when it finished. As the anthem ended, Josh Lewsey glanced up in the crowd in acknowledgement at its general reception. Everyone in the ground seemed to have resolved in some strange unspoken agreement that this was going to be the loudest rendition of the national anthem ever. It was like there was world record attempt being made. No one was muttering it silently or mouthing along. William Wallace roaring 'freedom' was a whisper next to this. It transpired that there was still a game to be played. Jonny Wilkinson, playing Ireland for the first time since landing the Grand Slam in Dublin in 2003, whipped over the a penalty in the opening minute. There was a certain fear around. The thought of losing to England is a hard one to stomach most times but the thought of that day was almost unbearable. Ireland's clinical superiority calmed everyone in the next twenty minutes. Three penalties were lobbed over by Ronan O'Gara and things were ticking over nicely. Girvan Dempsey slid over for a try and we were away. There was a fear beforehand that England were surely due a win against Ireland. The three in a row over them was completed in 2006 and pessimistic mothers were inclined to think we were pushing it expecting four. Just before half-time, David Wallace powered over the line and there was even a scent of hammering in the air. While RTE went to the ads, John Inverdale asked his audience whether they could possibly have predicted this scoreline 40 minutes in. Blonde winger David Strettle touched down in the corner, giving us a brief pause. But this was a prelude to the most euphoric moment of the day. Still leading 29-13, Ireland pummeled the English line once more, Stringer sprayed the ball back to O'Gara, who nonchalantly lifted the ball towards the opposite corner and a former Meath minor rose highest to claim the ball and touch down, effectively sealing the match. The rest of the match was a conga dance. A thoroughly subdued England were beaten and battered. They were absent minded enough to gift Isaac Boss another try at the end which was taking the piss a bit. Paddy Wallace clipped over the conversion and the players could devote themselves fully to the celebration at hand.